Pregnant Tibetan antelopes have began their annual migration to birthing grounds in the heart of northwest China's Hoh Xil nature reserve 10 days earlier than normal, according to the reserve's management bureau. Every summer, large groups of antelopes travel more than 600 km to lakes in the reserve, dubbed as "comfort zones", to birth calves. The first migratory group has already crossed the Qinghai-Tibet highway in their march toward Zonag Lake in the depopulated highlands of the world's highest plateau. Liu Yanlin, a researcher from Peking University who monitors the animals, said the early migration may be related to the effect of climate change in the region. 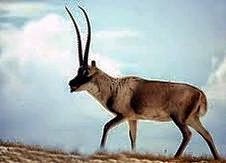 Tibetan antelopes traveled from traditional habitats in Sanjiangyuan of Qinghai, Qiangtang Basin of Tibet and Altun Mountain of Xinjiang. The population of Tibetan antelopes was reduced to less than 20,000 in the last century as they were targeted by poachers for their furs, which is dubbed "soft gold". The number has recovered to 60,000 at present, after the reserve was established 2006 to tighten the combat against poaching.